The forward-thinking metalheads in Mudvayne get a grip on their eccentricity. Mudvayne's alien metal has always been caustic; now it's catchy too. Mudvayne's four masked members have always had a flair for the mysterious, even the illogical. It starts with their appearance: The demonic makeup they wore on their first album bore no relationship to the music they played. It was image for its own sake: cool-looking, perhaps, but ultimately just a distraction. And maybe that was a good thing. Considering how complex the Peoria, Illinois quartet's music tended to be, the costumes (and the sci-fi pseudonyms each member adopted) gave headbangers an easy entry point into an otherwise impenetrable sound. Mudvayne's bristling major-label debut, L.D. 50, went gold. 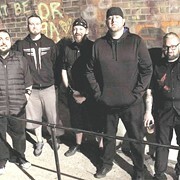 It was buoyed by an eye-popping, heavily-played video for the single "Dig" and nearly two years of touring, opening for the likes of Slipknot and System of a Down, and headlining the second stage at the 2001 Ozzfest, where the baggy-pantsed masses faced the daunting task of trying to mosh to Mudvayne's jagged riffs and impossibly complex rhythms. Still, the fan base kept growing, and the accolades continued to mount. The "Dig" video won the first-ever MTV2 Award, and the band's acceptance speech (for which each member sported a tuxedo and a fake bullet hole between the eyes) was the show's highlight. "I don't think it was necessarily an award for us; it was more of a metal award," says bassist Ryan Martinie (a.k.a. "Ryknow"), recalling the band's surprise when viewers chose Mudvayne over the more well-known, pop-leaning competition. "I think the metal fans were like 'Let's get one for the metal.'" But if the MTV2 Award was a commercial coup for an uncommercial-sounding band, it also typified how Mudvayne has made a career out of confounding expectations. After making headway among metalheads with an extreme sound and look, the band is now tempering its musical ambition with more hooks. They hope their latest album, November's The End of All Things to Come, will find an even wider audience, and that appears likely to happen. 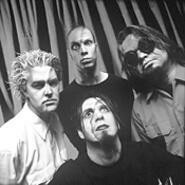 Formed in 1996, Mudvayne self-released its raw, roughshod debut, Kill I Oughta, in 1998. With Slipknot percussionist Shawn "Clown" Crahan on board as executive producer, 2000's L.D. 50 was a perplexing, polyrhythmic beast full of dizzying time changes, throat-grating screams, and impressionistic, often nonsensical lyrics. The album, Mudvayne's first for Epic, boasted a dry, airless feel (think of Prong's Beg to Differ crossed with Meshuggah) and owed much to the band's nü-metal peers (slapped bass, jump-up-and-down rhythms, a Slipknot vibe). The End of All Things to Come, Mudvayne's second Epic release, is much more subtle, more focused on songs as songs, rather than multipronged assaults on the listener's senses. "I think one of the first things that people are going to hear is just the difference in actual tonality," Martinie says. "The overall timbre of the album is slightly different, just due to production." After cutting L.D. 50 with GGGarth (Jesus Lizard, L7, Rage Against the Machine), Mudvayne turned to art-rock guru David Bottrill (Peter Gabriel, Tool, King Crimson) for The End of All Things to Come. The result is a smoother sound that focuses on flow, rather than mere juxtaposition of riffs and fills. The difficulty of Mudvayne's time signatures and tunings will still draw comparisons to other instrumentally proficient (and less successful) bands, but Mudvayne doesn't fall prey to the showboating that's common among similar acts (Dillinger Escape Plan, anyone? ); the band has learned not to make the mistake of being so complex as to alienate its audience. "We did that with songs like '(K)now (F)orever' and 'Pharmaecopeia,'" Martinie says. 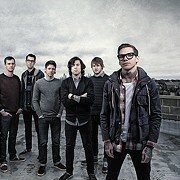 "When you've got choruses in 11/8 and verses in 16/18 or whatever, most people can't count that far and feel anything. But we've grown up as people, we've grown together as a band, and it's a very natural progression for us to go the route that we have. None of it was forced." Indeed, The End of All Things to Come has an organic feel largely absent from L.D. 50. Songs aren't composed solely of riffs stacked up and sequenced; the progression from verse to chorus and back again feels natural, inevitable. Martinie's bass lines are more propulsive, without the overt funk sound of earlier songs. 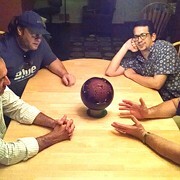 The album moves forward, rather than gripping one small patch of ground and working it in knuckle-busting frenzies. Plus, as the nearly catchy single "Not Falling" demonstrates, there are actual hooks this time out. That, Martinie says, is the result of "our specific effort to create a little more space between the notes and leave some room for Chad [Gray] to actually sing, because he does have a great voice, and he deserves to have songs that he can actually utilize his instrument in, instead of just screaming his head off." The band has its act together visually too. 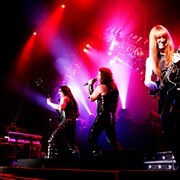 The individual demon outfits sported for the last record have been replaced by alien garb worn by all four members, in the manner of the Residents. The sum of the changes, both on record and in costume, amounts to something closer to reinvention than evolution. The End of All Things to Come is practically another debut album -- Mudvayne 2.0. It's a good time to be reappearing this way, too. In the coming months, Mudvayne will face its largest audiences ever: Its current headlining tour will be followed by an opening slot for Linkin Park, then a spot on Metallica's Summer Sanitarium tour. It'll be interesting to see what Mudvayne does with the opportunity -- and what the larger rock world makes of the band's alien soundtracks. For Mudvayne, this could just be the beginning of The End.